I don’t usually write about fashion, as I don’t consider myself a fashion expert. I do know a couple of things though: black is always in, socks in sandals are always bad, and buying American Apparel is a guarantee for quality. When I stumbled onto this event starting next Friday, I knew it needed to be shared. American Apparel has been touring this warehouse sale around the world, with previous editions in Montreal, Toronto, Los Angeles and London. 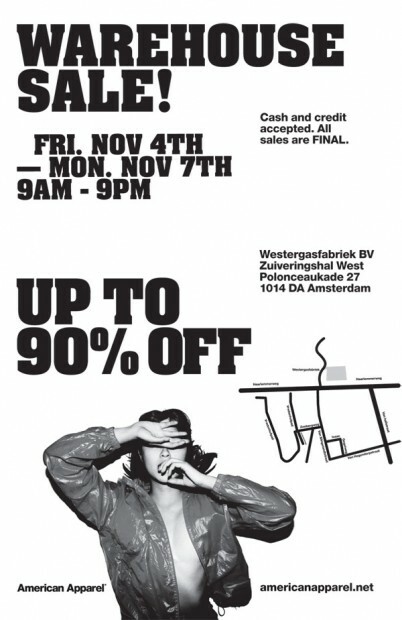 They promise items from €1, up to 90% discounts, and constant refilling of the stock. Score!